This Gettysburg trip was hosted by DestinationGettsyburg.com. All thoughts and opinions are my own. It’s been about seven years since I’ve been to historic Gettysburg and Ryan had never been there. I’ve always been in awe of the Battle of Gettysburg not only because of the Civil War, but also because of the struggle that the townspeople went through. The first time I visited Gettysburg, I was in elementary school. Since then, I have been there several times. The fantastic thing about Gettysburg is that there is always something to be learned. There are a huge variety of ways to experience the battlefield, visit the museums, and browse the stores so here are some of my favorite options. I’ll be honest, the Battle of Gettysburg can be overwhelming for those who aren’t history buffs. Talking about Cemetery Ridge, Seminary Ridge, and the Roundtops can be confusing. While you can tour the battlefield in many different ways, I always recommend doing some sort of a tour in order to an overview of the battle and understand the significance of the many different events. For us, I have been to Gettysburg several times in the past but this was Ryan’s first time and he didn’t know a lot about the battle. 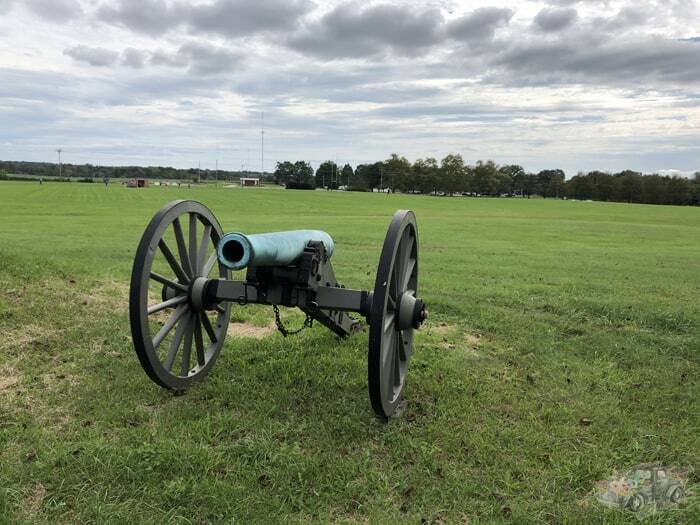 With a battlefield encompassing nearly 6,000 acres; 26 miles of roads connecting battlefield landmarks; 1,300 monuments, markers, and memorials; 400 canons; and numerous historic structures it is easy to miss something. In my experience, the absolute best and most economical way to experience the battlefield is by hiring a licensed battlefield guide. Your guide can determine what interests you most and provide a truly unique experience. Plus, you can ask as many questions as you want. Since the roads through the battlefield can be confusing, your guide will even offer to give your car so you can just listen and not have to worry about driving. Be sure to let the tour guide know where you are from or what your hometown is. 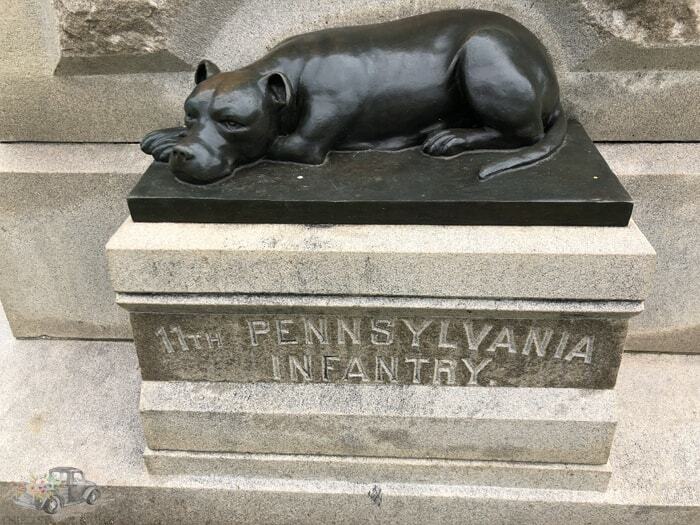 I let our guide know we were from Westmoreland County, Pennsylvania, so our guide showed us the 11th Pennsylvania memorial which features Sally the War Dog. This tour was a great way to get an overview of the three-day Battle of Gettysburg. It gave both Ryan and I a great foundation in order to visualize and prepare us for the weekend’s other activities. These tours can be booked at the Visitors Center and last approximately two hours. It costs $75 for a car of up to five people. Considering the bus tours are $35 a person, this is a great deal for a one-on-one tour. 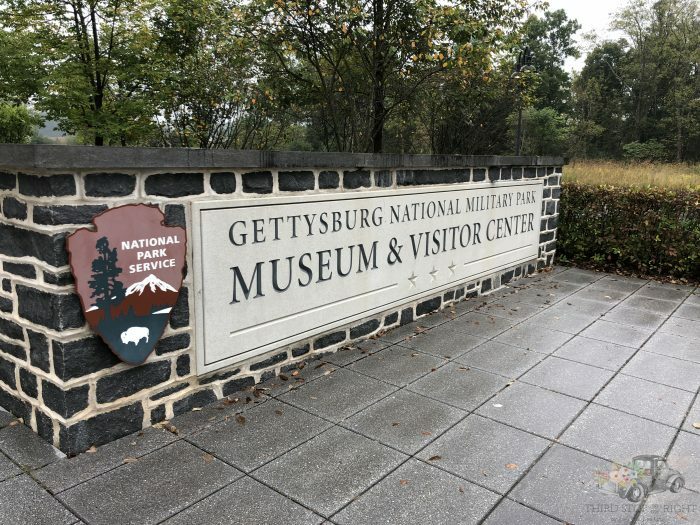 After getting an overview of the battlefield and an understanding of what happened, you need to visit the Gettysburg National Military Park Museum and Visitor Center. This museum features a fantastic, interactive exhibit which details the war from the inception up until the July 1 battle of Gettysburg. It is a great way to see artifacts up close and really feel as if you are a part of the battle. You will want to buy a ticket to see the Gettysburg film, narrated by Morgan Freeman, which will give you an overview of the political climate of the time as well as the events leading up to the war. This will give you a very good basis of what you will experience in the museum. 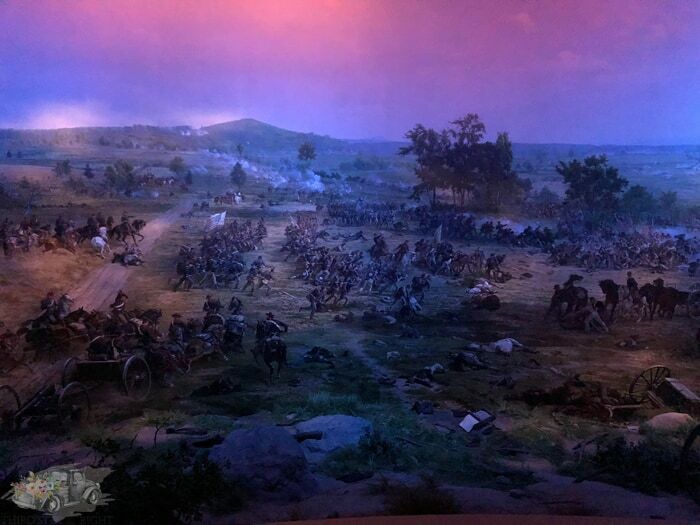 The museum is also home to the world-famous Cyclorama painting. 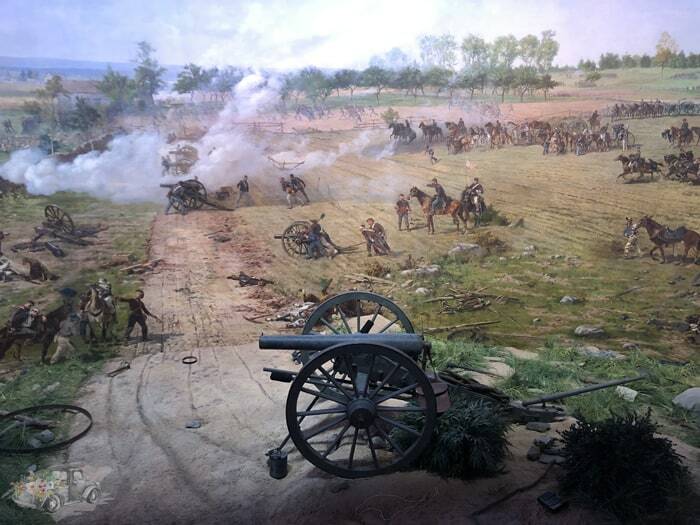 The painting, which was painted by Paul Dominique Philippoteaux and unveiled in 1883, is a 360 degree painting which depicts the battle of Pickett’s charge. The finished painting was nearly 100 yards long and weighed six tons. 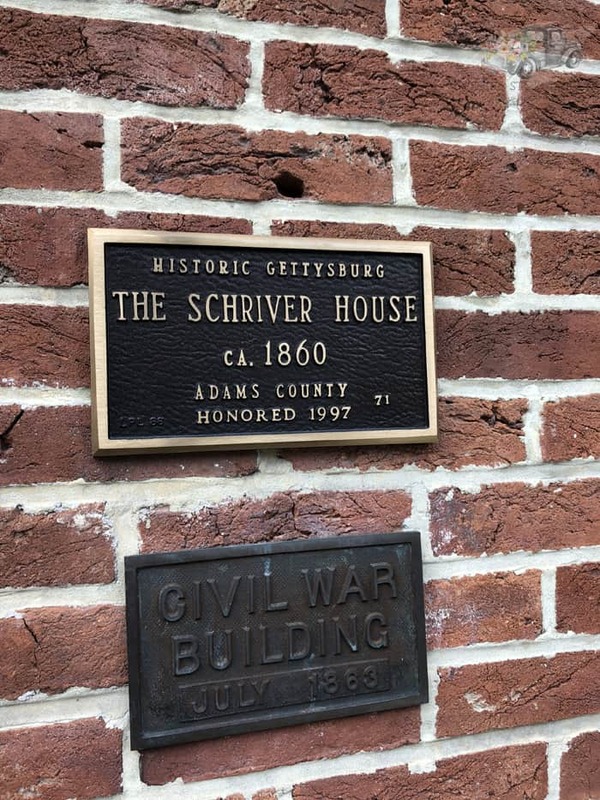 This is a must-see if you are visiting Gettysburg. 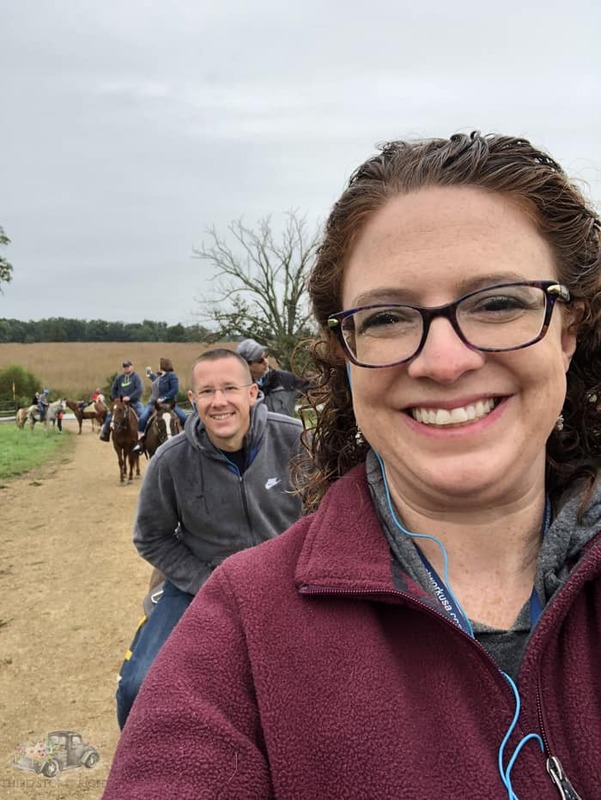 There are tons of ways to experience the battlefield including walking, bus, car, Segway, carriage, and even horseback. Since this trip was only going to be Ryan and I we decided to do something that we couldn’t necessarily do if we had the boys with us. This is why we chose to do the Confederate Trails Battlefield Tour. Fewer than 1% of visitors choose horseback as a way to tour the battlefields. This is such a unique way to tour the battlefields as you are actually riding the same trails and following the same movements as the Confederate generals during the battle. 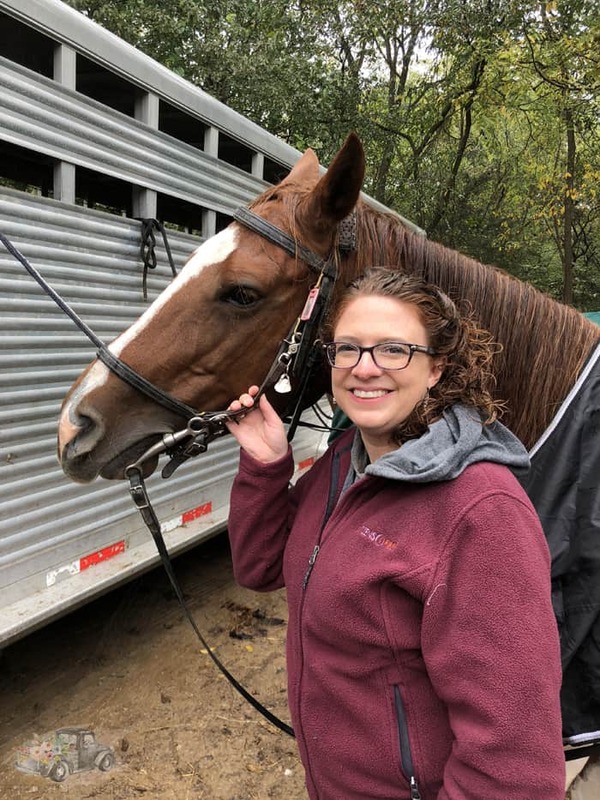 The tour is narrated by one of the licensed tour guides so not only do you get a trail ride but you also get an overview of the Confederate troop movement during the days of the battle. These rides are rain or shine, so if the weather is iffy you will want to bring rain gear. The day that we went on our ride it was drizzling, but it didn’t deter us. The ride lasted about two hours and we explored many of the monuments and key areas of interest behind the Confederate lines. It was definitely a unique experience and something that I would recommend to anyone who wants a unique battlefield perspective. 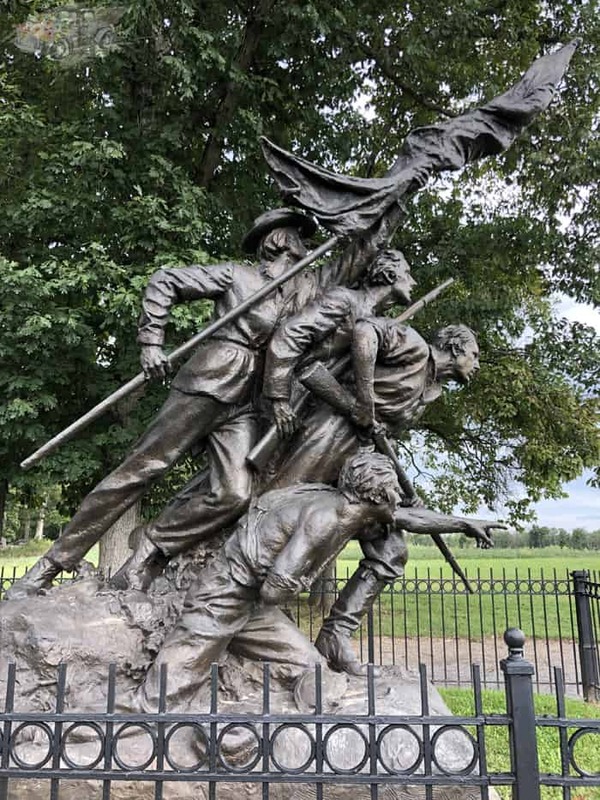 There is always so much emphasis on the military aspects of the Battle of Gettysburg that people often forget about the impact of the battle on the civilians. Gettysburg was a town of only 2,400 citizens, but during the battle more than 200,000 troops occupied the city. After the battle was over 51,000 troops were left wounded, killed, or captured. This was a tremendous strain on the town, and forever changed the lives of civilians such as George and Hattie Shriver and their daughters Sadie and Mollie. 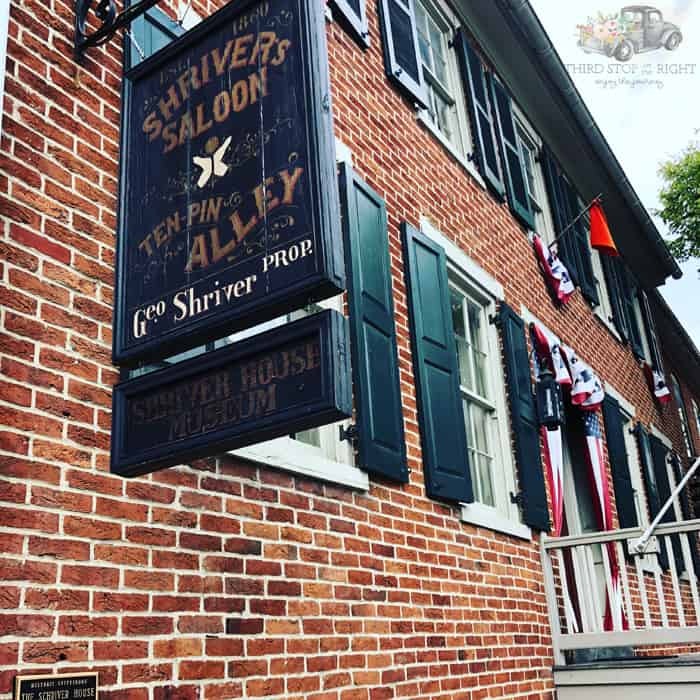 The Shriver House Museum tells the story of the Shriver family who occupied the home during the days of the battle of Gettysburg. Once abandoned for 30 years, the house had missing window panes, no electricity, no water, no heat and a serious leak in the roof, it has been meticulously restored to look as it did in the 1860s. 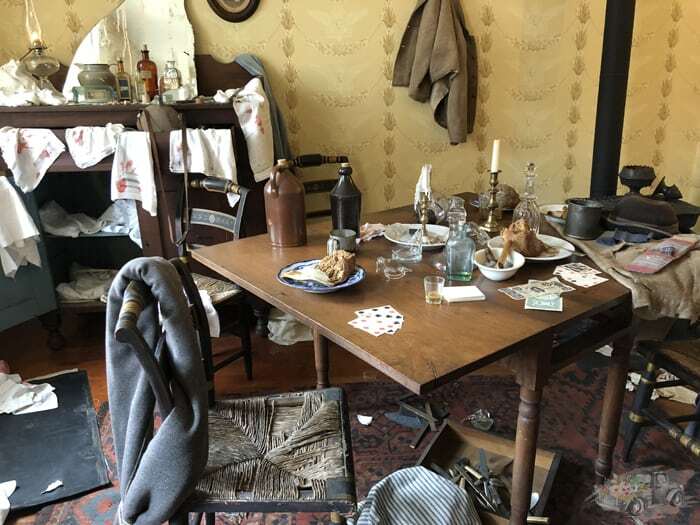 You can even visit the attic room in which Confederate snipers used during the battle. Forensic investigators have confirmed the presence of blood in the attic, consistent with reports that two Confederate troops had been killed in the attic. Ryan and I have experienced some really fun ghost tours in the past such as when we went to Charleston or even Key West. Gettysburg is said to be one of the most haunted locations in the United States. With so much death, disease, and suffering it makes sense. 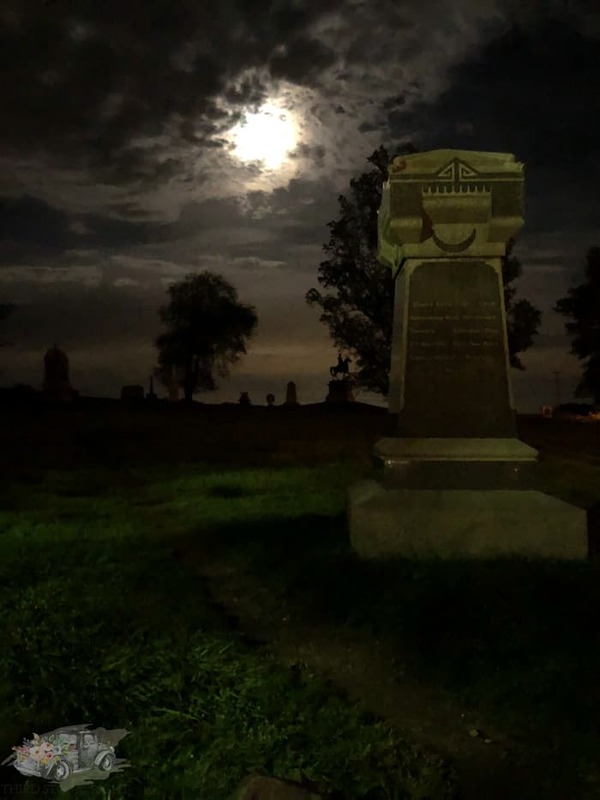 The tour we went on, hosted by Ghostly Images (which is housed housed in the old orphanage) takes you on a brief walking tour to the edge of the cemetery, behind the 1863 Inn at Gettysburg, and finally ending up at the Jennie Wade House. The nice thing is that this was a small tour with less than 20 people. 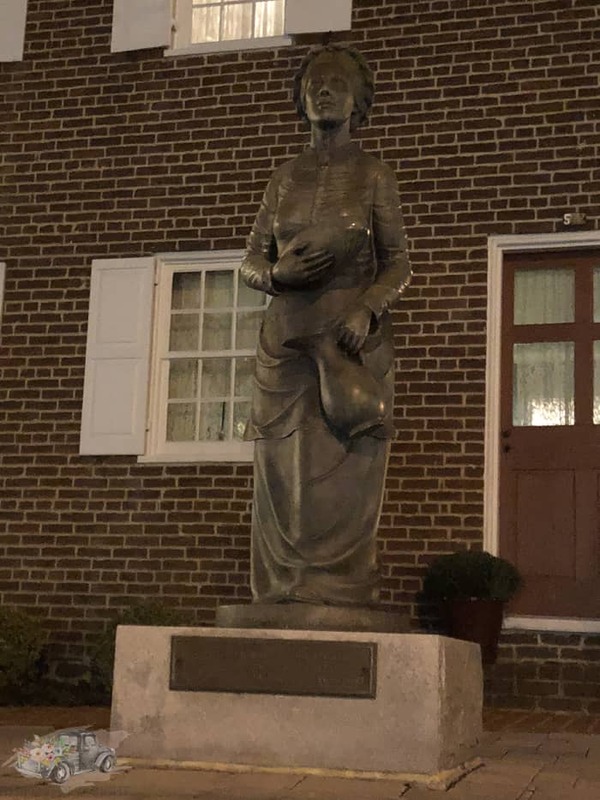 We got to go into the Jennie Wade House after the fall of darkness and were able to hear about the ghost stories related not only to the death of Jennie Wade, who was the only civilian killed in the Battle of Gettysburg, but also regarding the orphans who used to play in the house. We did a little “ghost hunting” which involved taking some pictures and video inside the house looking for anomalies. I don’t think I found much … until the last photo I took of the house before leaving. I wanted to get a photo of the Jennie Wade statue with the house in the background to use for this blog post. When I later looked at the photo I was a little shocked to see something a little odd in the bottom corner of the window. It actually looked like a little boy’s face as if he was looking out of the window. What do you think? There are so many different restaurants in Gettysburg that it can be hard to pick a favorite. For our time in the town, we did most of our dining in the main square of town by the roundabout. It was within close distance to our hotel and there were a variety of options to choose from. Parking can be a little tricky, however, and metered spots are the norm so be sure to have plenty of quarters on you. We decided to have a late dinner in downtown Gettysburg. 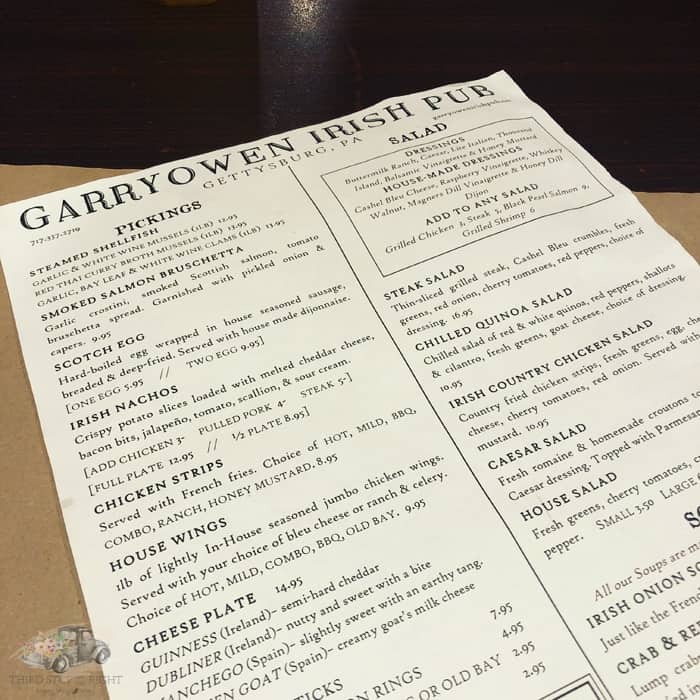 Right off the main traffic circle was an adorable Irish Pub called Gerryown Irish Pub. I had been there once before, but it was quite a few years ago. I did, however, remember what I ate and couldn’t wait to have it again. We started out by ordering a few drinks and some mozzarella sticks. We had a table tucked in the back by the back bar, so it was quiet and easy to talk. I decided to go with my old favorite — the Shepard’s Pie. I’ve had Shepard’s Pie before and this is definitely one of the best! The whole menu, in fact, is inspired by traditional Irish dishes, as well as some classic favorites. On our second night in Gettysburg, we ate dinner at the Pub and Restaurant which was right off the main roundabout. I loved the antique look of this restaurant, including a beautiful tin ceiling. It was really busy that night and we didn’t have reservations so we ended up just snagging seats at the bar, but you could still have a full meal there. Both Ryan and I ordered Italian sandwiches and not only were they huge but they were also delicious. Since we had some time before our ghost tour we decided to order dessert — the only problem was that we ordered one each. The slices were huge! In fact, there was so much leftover we had to get boxes to take some home. It was totally worth it though. There are a lot of charming bed and breakfasts in Gettysburg, but they can often be expensive and depending on the season, hard to come by. We arrived in Gettysburg on a Friday evening with plans to hit the ground running in the morning. 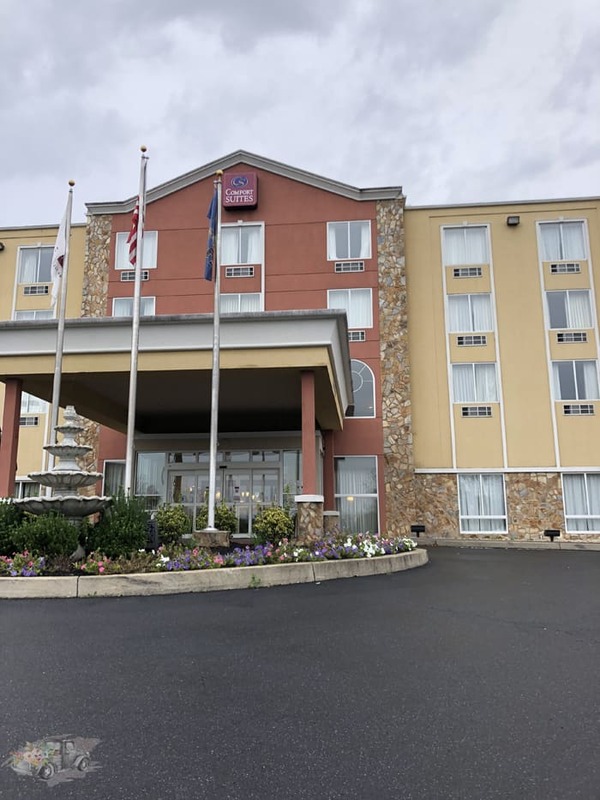 We stayed at the Comfort Suites in Gettysburg, located just beyond Cemetery Ridge. 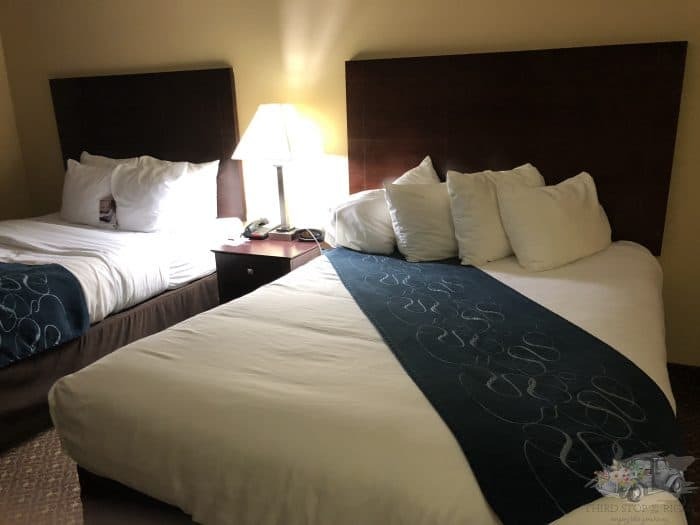 Not only were the Comfort Suites close to the battlefield, but they were also very nice. Did I mention that it also has a free continental breakfast? After checking in, we headed up to our room. 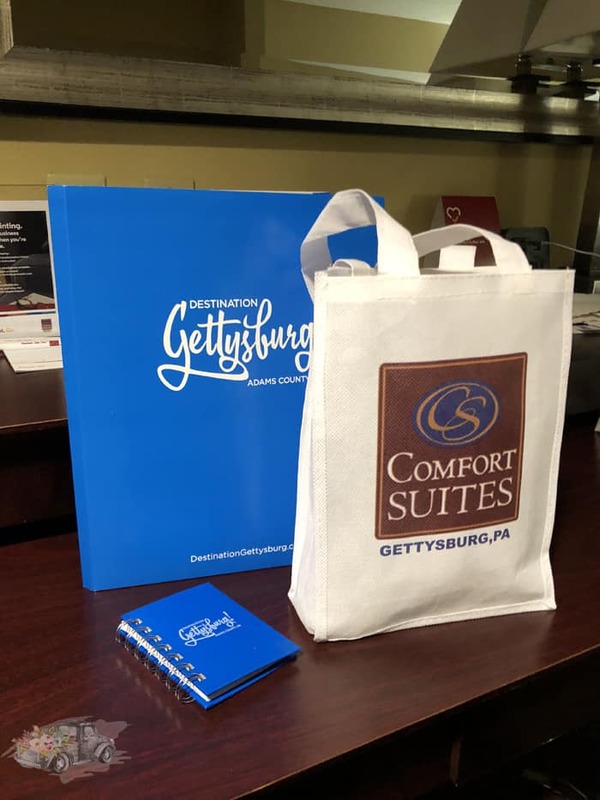 Since this trip was sponsored by Destination Gettysburg and the wonderful folks there not only arranged our accommodations and itinerary, but also left us a wonderful gift bag in our room with gift cards to local restaurants, brochures, and even a few items for the boys. 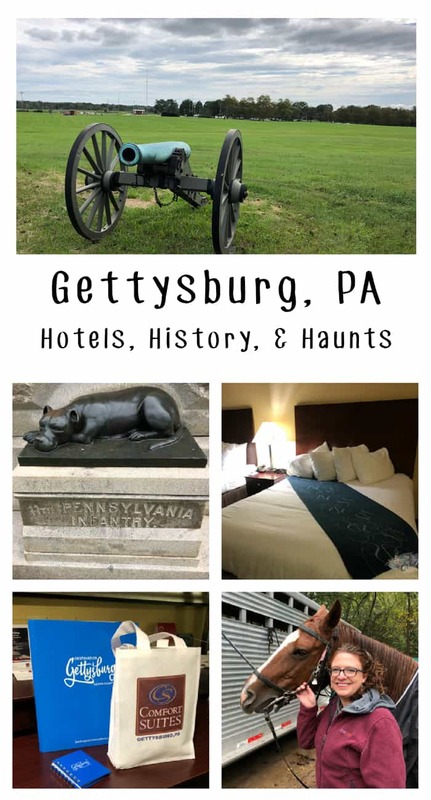 If you plan to visit Gettysburg for yourself, be sure to check out the Destination Gettysburg website for planning ideas and deals.